Let us premise this article by acknowledging that inflatable floating docks are surprisingly expensive. Indeed, floating docks have always been a part of our summer holidays because no fun beach story starts with swimming alone. Accordingly, inflatable floating docks are part of our culture because they bring families, friends and couples closer and overall add significant value to our vacations. There are different types of floating docks but the most common of which has got to be the inflatable ones as they are easy to pack, light weight and can usually handle an impressive amount of passengers. 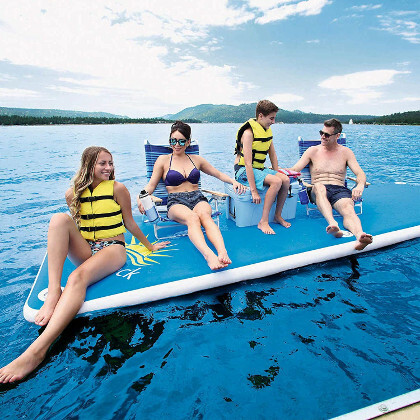 Nevertheless, all inflatable beach accessories have a notorious reputation for breaking too soon which is why we are bringing you a selected list of the best inflatable floating docks to save the day. Our first contender is the floating Mesa dock, created by Driftsun. Now, it is of some value to know that Driftsun is actually a leading manufacturer in the inflatable stand up paddle board industry as it necessarily feeds its production of docks. 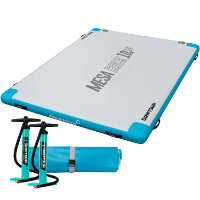 Accordingly, the Mesa dock might have gained the advantage of inheriting the brand’s reputation. However, is it going to maintain that head start? 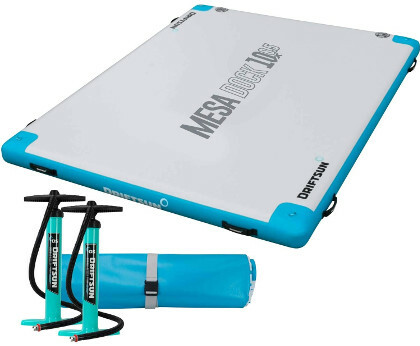 Well, evidently, the Mesa dock benefits directly from the brand’s iSUP legacy, showcasing a UV resistant high pressure multi-layer PVC coat that is featured in most white wash rafts. Further, the coat is fortified even more via an industrial drop stitch construction, perfectly sealing all exits and giving the dock a reliable body and structure. Further, in order to attain a wider range of potential customers, the Mesa dock doesn’t shy out from waving around its 600 pounds weight capacity. Indeed, the dock measures a decent 8 feet by 6 feet, making it capable of easily handling 2 passengers. Additionally, Mesa dock takes pride in its stability thanks to its 6 inches thick hull and actually invites you to bring along lounge chairs and coolers. 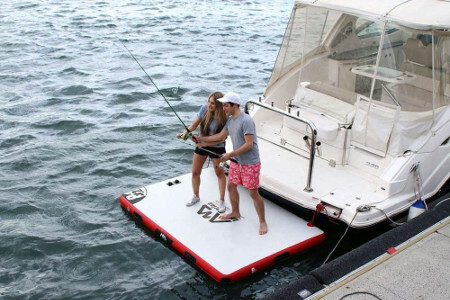 All in all, the Driftun Mesa Dock is a nice medium size inflatable floating dock with potential to keep you and a companion very satisfied but that’s not all. In fact, this dock features neoprene handles on all sides for easier transportation and easy access, dual valves and two hand pumps for a twice quicker inflation and a number of anchor D-rings to hook / secure your boards, gear, or anything you don’t want to lose to the waters. Bestways might not be the prodigy of a prominent brand but it definitely is bringing a fight to court. Indeed, since announced, this has been a highly hyped floating dock for a number of reasons. So, does it have what it takes to make you click the purchase button? First things first, quality is a significant factor for any new brand because it can literally make or break them. Hence, you can imagine the pressure on this inflatable floating dock as it attempts to represent an entire brand. Luckily, Bestways is willing to make a second appearance and that can be seen through its reinforced PVC coat and rigid drop stitch construction. The creation of this deck entails a process involving tens of thousands fine fibers that connect two pieces of durable PVC together. Undeniably, this combination is the toughest thing you can imagine for. It is capable of enduring white water, rocky bottoms and party times. Moreover, in order to cater for a party you must first have enough space and Bestways have plenty of it. In fact, the sun deck is one of the few out there that reaches 15 by 5 feet and that is splendid. Hence, you can easily fit an entire family on this thing and still have more space for chairs, coolers and other accessories. Further, the dock measures 6 inches in thickness, which makes it capable of handling up to 1000 pounds easily. 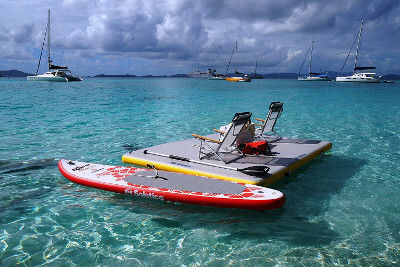 Eventually, the Sun deck is the summer inflatable platform that your family / friends, anglers, and sunbathers would love. So, is this the dock of your dreams? Back at it again with another iSUP brand that is trying to take over the inflatable floating dock universe. Accordingly, the Solstice inflatable dock comes in at a steady pace, being the descendant of a reputable brand but does it have what it takes to take down its competition? We always talk quality first in our reviews and this is a product we are excited about. 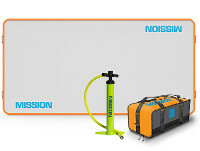 Indeed, the Solstice inflatable dock is setting an example for all docks out there by committing to a 1000 denier 3 ply industrial grade PVC fabric which is further reinforced via an machine orchestrated drop stitching process that shuts the hull tight on its edges, eliminating the possibility of punctures and mishaps. Further, the dock at hand is one of the few out there that comes in a variety of sizes. Indeed, the Solstice dock can be purchased in a 6 by 5 feet, a 8 by 5 feet or a 10 by 10 feet format. Thus, you get to choose the dock you need, depending on the amount of fun you’re planning on having and the number of your designated passengers. Further, the dock features a triple laminated material that is 6 inches thick, which is capable of supporting up to 10 people on the biggest model. Finally, it is always good to know that this inflatable dock is featured with the several stainless steel D-rings that will keep your accessories locked and secured as you cruise around. It also comes with multiple carry handles so you can easily carry it around. 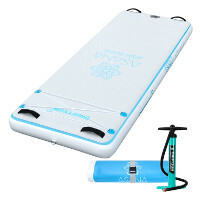 Aqua Marina has been a leader in the inflatable water sport universe due to its successful line of inflatable paddle boards. However, it is planning to take its expertise to the inflatable dock realm which was an anticipated move from a brand this big. Indeed, Aqua Marina has made a name for itself in the industry with its renowned quality.However, does that translate well into inflatable floating docks? Well, apparently yes because the brand still features a high density layered PVC coat that is pulled together via an intense drop stitching process that invests in a technology of high frequency per square inch. Therefore, you can expect this dock to endure pretty much anything from white water to regular sized waves. Further, size has always been a big deal which is why Aqua Marina goes for an impressive 8 feet 2 inches by 63 inches, making this platform one of the biggest in the industry. Also, the dock measures 6 inches in thickness which means that it would easily handle up to 600 pounds before it reaches maximum capacity. Eventually, Aqua Marina is known for being a people’s brand which explains the abundance of carry handles that this dock is featured with which allow for easier transportation, the nifty D-rings and the much appreciated paddle docks. To wrap it up, we’ll take a detour towards Driftsun but this time we’re inspecting a different inflatable floating dock. Indeed, the Asana is supposed to be a significantly different dock with an interesting profile. So, how interesting is it really? Well, since quality is our initiator, we are glad to learn that Driftsun does not change its approach towards quality between products. Accordingly, the Asana remains one of the most resilient docks on this list due to its multi layered PVC material and high intensity drop stitch construction. The dock is thus made to endure multiple environments with minimal to no risk of punctures. Further, it is important to note that this is indeed a special inflatable floating dock because it is designed with a yoga lover in mind. Indeed, the dock at hand measures 7 feet by 33 inches, matching the size of most yoga mats out there in order to truly involve you in the experience. 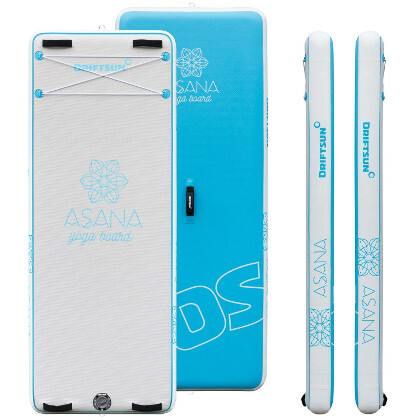 Also, the Asana dock measures 6 inches in thickness which means it is capable of handling up to 200 pounds as a maximum weight capacity. Eventually, the dock also takes pride in a selected variety of features that make it an even better yoga platform. In fact, the board / dock at hand exhibit a extending gripping pad that covers the entirety of the surface to grant you the needed grip to remain stable at all times. Further, the dock comes with a nifty 4 D-rings cargo net for personal belongings and a practical set of handles on the top and bottom.